What does MVP mean anyway? What does it mean to be the Most Valuable Player in Major League Baseball? Is it the player who added the most wins to his team? The player who added the most wins to his team, so long as they made the playoffs? Can it ever be a pitcher? Is it the player who contributed the most to his team down the stretch? Admittedly, MVP is always going to be a subjective award, based on the perception of the members of Baseball Writers Association of America selected, in any given year, to vote for the award. But modern statistics give us some insight into how those writers make their decisions—even if it is not entirely clear to them when they are voting. First, let’s look at a few possible methods of selecting the MVP. Wins Against Replacement or WAR is a fairly recent statistical calculation that measures (words). It quite literally measures what player had the most valuable impact on his team in a given year. Yet, only five times in the past 25 years has the American League leader in WAR been awarded the MVP. How about awarding the MVP to the highest WAR player on a playoff team? This may help. 21 of the previous 25 AL MVP’s were on teams that went to the playoffs (including for the purposes of this article, Frank Thomas, whose Chicago White Sox were in first place in the AL West in 1994 before the player’s strike ended the season). But even this doesn’t completely answer our question. Many of the players who won the award were not even the top WAR players on teams that made the post season. In 2006, Justin Mourneau won the MVP with a WAR of 4, while his teammate, Johan Santana led the league in WAR with 7.3 wins against replacement. Some may argue that a pitcher should not be eligible for the award, anyway. This is where things get particularly tricky. One issue is that the voters change on a yearly basis. If a voter doesn’t believe a pitcher should not win the award, he can simply leave the pitcher off the ballot and doom his chances. See Martinez, Pedro, 1999. But the reality is, pitchers, do win the award on occasion. It has been posited that this honor is saved for pitchers only when they have had a truly transcendent and historic year. This theory is simply not backed up by the numbers. In 2011, Justin Verlander was the AL MVP with a WAR of 8.2, good for second in the league. It was a truly awesome season by any measure. The league leader in WAR? You guessed it: Ben Zobrist. Zobrist carried an 8.5 WAR and his Rays made the playoffs. He finished 16th in MVP voting. You can’t entirely blame the writers for going with Verlander though. He was a monster. Going back for a moment though, how good was Verlander’s year historically? Obviously, WAR is not set up to measure 2011 Verlander to 1999 Pedro Martinez, but the statistic does measure them against their competition for the award. Over the last 25 years, the following pitchers led the league in WAR, but did not win the MVP: Roger Clemens (1987, 1992, 1997), Brett Saberhagen (1989), Kevin Appier (1993), Randy Johnson (1995), Pedro Martinez (1999, 2000), Santana (2006), Zack Greinke (2009). In fact, Clemens’ 1997 campaign (11.8) and Martinez’s 1999 season (11.4), are the two best seasons as measured by WAR in the last 25 years. So, was Verlander’s 2011 season more deserving of the MVP? Probably not. It’s not as if the MVP voters are picking completely randomly, though. In fact, over the last ten years, seven AL MVPs were in the top three in WAR. Of course, the other three (Mourneau, 2006; Vladimir Guerrero, 2004; and Miguel Tejada, 2002), were 10th or worse in the league in WAR. What happened and how did they win the MVP award? A couple things to look at here. First, all three of those teams made the playoffs. That helps. As I mentioned earlier, despite the fact that Mourneau was not even first on his team in WAR, he was second to pitcher Santana, who undoubtedly lost votes based on the perception that pitchers should not win the award (however inconsistent this theme is, it’s impossible to ignore that it often does affect voting). Same story for Tejada in 2002, who was behind teammate Barry Zito (6.4) in WAR. In 2004, the league leader in WAR was Ichiro Suzuki (7.5), whose team won 63 games. You can understand why the voters might not associate “valuable” with a team that lost 99 games. Guerrero took home this prize that year despite a WAR of 5.2, which was good for only 10th in the league. Likewise, in 2002, Tejada and his 5.3 WAR won the award over Alex Rodriguez and his 8.6 WAR. Of course, Alex’s Rangers won 72 games. So, the argument against the WAR winners from those seasons makes (some) sense. Two played for dreadful teams, one suffered from anti-pitcher bias. But what about the rest of the players ahead of Mourneau, Guerrero and Tejada? This is where intangibles step in. The question in voters minds: Did you have a MOMENT? Let’s look, for example, at Guerrero’s 2004 season. His OPS for the final month of the season was 161 points higher than his full season OPS. While his Anaheim Angels only went 17-14 over that stretch, they finished on a tear going 7-2 and slipping into the playoffs. While his full season WAR was not at the top of the league, it looked (probably accurately) like he single handedly dragged them into the playoffs in the end. He had a MOMENT. It was fresh in the voters’ minds and he got the MVP. So is it a great September performance that puts a player on the top of the MVP head? Not necessarily. In 2006, Mourneau put up a beefy .926 OPS, but in the final month of the season his OPS was only .884. What gives? Mourneau’s moment was not the end of the season, but rather the eight week period in June and July when the world was really introduced to the Twins first baseman. In June and July, Mourneau put up 1.137 and 1.130 respectively. Meanwhile his team went 37-15, a win/loss percentage of .711. For the season, the Twins won at a .596 clip. Mourneau had eight weeks where he played his best ball while his team tore through the league. He had a MOMENT. Ok, so what about Tejada? He must have had one stretch where he absolutely crushed it, right? Not really. Tejada had a relatively so start in 2002, but for the most part he was consistent throughout the season. His monthly OPS was as follows: .813, .807, .867, .910, .879, .888. Definitely stronger in the second half, but not the major swings of Guerrero and Mourneau. So what was his moment? You’ve read or seen Moneyball, right? Yea, the most memorable thing to happen in 2002 (probably even more so than who won the World Series), was the Oakland A’s 20 game winning streak from August 13 to September 4. In a season in which the A’s lost Jason Giambi (who, interestingly led the league in WAR the previous year, but did not win the MVP) and Johnny Damon, Tejada was widely considered the best position player on the most memorable team of the regular season. In other words, that winning streak? It was a MOMENT. A statistics purist would, of course point out that if these players were more consistent like, say all of the people ahead of them in WAR, then they would not have needed these MOMENTS. Undoubtedly true, but also sort of missing the point. Baseball is a game of memories. Intangibles. It’s about that Oakland fan who will never forget for the rest of his life the run the A’s made in 2002 or the heroics of Vlad Guerrero seemingly dragging his team into the playoffs in 2004. Yes, Rodriguez and Ichiro had great years in 2002 and 2004, but chances are most people (their agents aside), would just as soon forget those seasons ever happened. 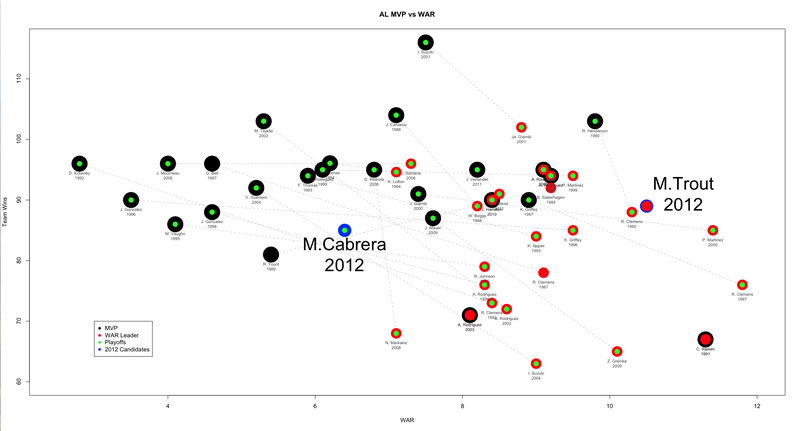 They were the most valuable players for their teams, but they were not the Most Valuable Players for baseball. MVP will always be a contentious issue. Lots of times it won’t make sense. I mean, who had more of a MOMENT then Pedro Martinez in 1999 or Roger Clemens’ “twilight year” of 1997? But perhaps, through all the fog, there is some semblance of a rationale for how the writers vote for this thing—whether they know it or not.